McIvor Ranch – Also known as the “U Up U Down Ranch”, is a working cattle ranch. 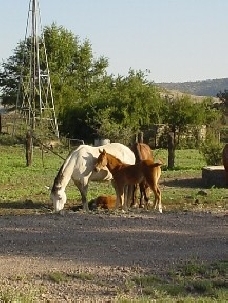 The ranch has remained in the family for over 125 years. Grams Ranch House is a great place to stay here in the Davis Mountains. It is a neat house with a lot of charm. It has a wonderful view of the McDonald Observatory from the front porch and a majestic view of Blue Mountain off the back porch. The house has three bedrooms with air conditioning in each room/two full baths. It has a living and dining area with TV and Cable/VCR/DVD. The house has a fully equipped kitchen including a washer and dryer. There is lots of wildlife. Birding, hiking, biking or just relaxing. $200 a night. We would love for you to come join us here at the ranch for a couple of nights or a while. Please contact us for more information and available dates. Julie & Scott McIvor.